Residential and commercial remote controls in Battersea SW11 - Garage door remote control. Remotes can be used for garage doors, gates, barriers and shutters. 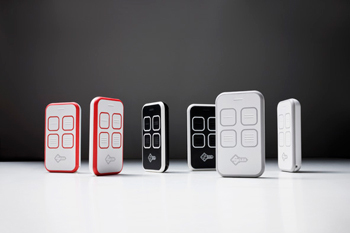 We have a range of remote controls that are a first-rate solution for duplicating residential and commercial remote controls and allows the duplication of the largest range of fixed and rolling code remotes available. It comes in three different cool designs, state-of-the-art technology and functionality, each covering either a different fixed or range of frequencies with each model is available in three different colour combinations. The remote controls are compact, durable, splash proof, ergonomically designed and are particularly suitable for barriers, gates and garage doors.